The holiday season is an easy time to put your feet up and relax at home, but there are so many ways you can enjoy your time without a) lying around all day, or b) spending a fortune. Two weeks ago, Eric and I planned such an outing based on this NYC tour put together by The Huffington Post. It started at Macy's/Herald Square and worked its way up to the Upper East Side, stopping at impressive holiday shop windows, city holiday displays, and tasty treats along the way. An outing like this is not only free, but also keeps you on your feet for a few hours as you walk around without even noticing the many steps you're taking! Another bonus is that you can spend some time outdoors! Getting outside has plenty of benefits, but unfortunately happens too rarely during winter. To warm up along the way, we stopped at Maison Kayser, as per HuffPo's recommendation to get a croissant and hot chocolate there. Eric had the croissant and I enjoyed the hot cocoa. 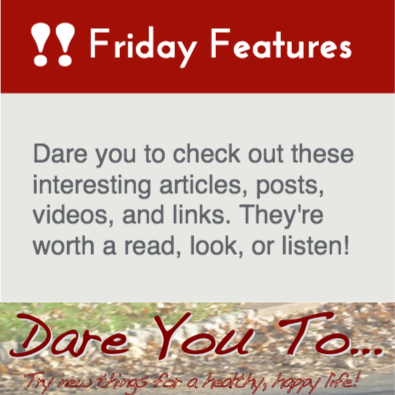 It's the return of Friday Features! Lately, I've been seeing more and more articles promoting some research findings that I've been living by for a while. Vindication! Love having a quick link to send to my friends, family, and YOU that unearths and explains some important science that impacts your life. "Light emitting e-readers detrimentally shift circadian clock" The American Association for the Advancement of Science recaps a research study's findings about the negative impact of e-readers' light on participants sleep quantity and quality, as well as their alertness and functioning the following day!! "Nutritional experts say it's time to stop fearing fat." by placing responsibility on the "nutritional experts." Pictures. I've always been a picture person. Come to think of it, it's a wonder I didn't invent Instagram, myself! I was the friend who used to always bring along a disposable camera (remember those? 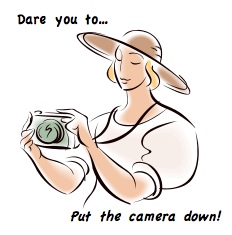 ), and then a digital camera (my Canon is my favorite), and now still often insists on bringing a real camera even though our phones take fantastic photos. I'm the one who shouts "Smile!!" to capture a fun moment. I snap candids, too. I photograph, share, scrapbook, and reminisce. I believe photos are an important tool to hold on to and re-live happy memories. So why am I daring you to put the camera down? Truthfully, I could just as easily tell you to TAKE PICTURES, and maybe someday I will. But for now, this is a dare I have personally been working on this past year. Hello, friends! How is your holiday season going?? Last month, I dared you to move on Thanksgiving, and I'm pleased to report I heeded my own advice. First, I helped my mother in the kitchen with the chopping of manyyyyyy colorful veggies. Later on, I was able to spend a decent amount of my holiday playing with my cousin's adorable two-year-old! His energy was contagious and I found myself out of breath more than once just following him around. I moved around, ate my vegetables, and enjoyed time with my family, so overall it was a happy and healthy holiday. 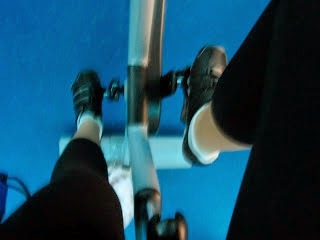 The morning after Thanksgiving, I even went to my old favorite Spinning and yoga classes! It's always fun to visit and work out with my first and favorite instructors. Health update: I'm finally well again! After over a month of pain, my cough has finally disappeared. My recovery makes me really glad I made the hard but healthy choicenot to run the 10k in October--definitely the smart decision. While I was sick, I intentionally stepped back exercise because my lungs couldn't handle it and I really wanted to get better. There's little glory in coughing myself through a workout, no need to put additional stress on an already stressed body. BUT, feeling well and ready to work out... how do I get back in? For me, it started with walking. As I explained in my post about not running my 10k, even walking around the city was leaving me short of breath. So, that's step one: Early in November, I began going on the treadmill on a slight incline, walking at 3.0 mph for 20 - 30 minutes. Later, I increased to 3.5-4 mph and also added in yoga stretching to warm up my muscles again.